What an exciting weekend! I'm back from San Francisco. I went for a class on food styling and tips on food photography. It was really fun and very interesting. Joy Wilson from Joy the Baker sand Tracy from Shutterbean were the teachers. They were full of ideas and great information. Now the trick is to put it to good use. Tracy and Joy prepared two recipes, and we got to style and shoot using our new props and tips. Here are some oat bars, and my best shot of the day. 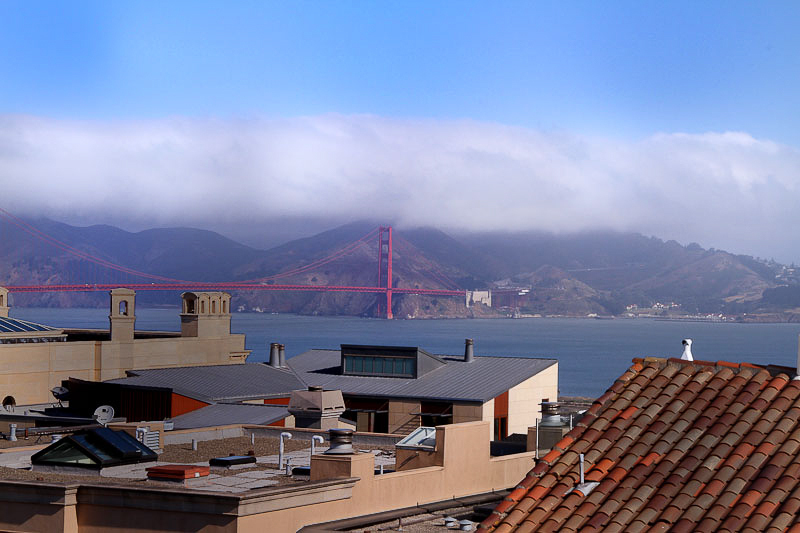 It's been awhile since I was in San Francisco. What a gorgeous city! The hotel's driver/maintenance man invited Gary and I to the roof top to see the view on our last morning there. Amazing! Here's my postcard to all of you! Upon arrving home, I found our CSA box brimming with lots of fresh vegetables. I wanted to make something crunchy, tasty and cool. My version of a grilled corn salad - minus the grill. The best part about this recipe is that you can use anything you like and leave out the things you don't like. I had little baby eggplants, zucchini, red onion, cherry tomatoes and fresh sweet corn. To start, shuck the corn and carefully slice off the cob. Then,heat a grill pan or skillet and place the corn in a single layer ith just a little olive oil. I used about 2 1/2 cups of corn and about 2 tsp. oil. Let the pan get hot, really hot. The corn will sizzle and snap. Get it quick stir and your should see searing on the corn. Move to corn to a heat proof bowl. Add eggplant (I didn't peel mine), and zucchini to the pan and saute for 3-4 minutes, just to heat through. Add these vegetables to the corn and toss. Now for the fun part. 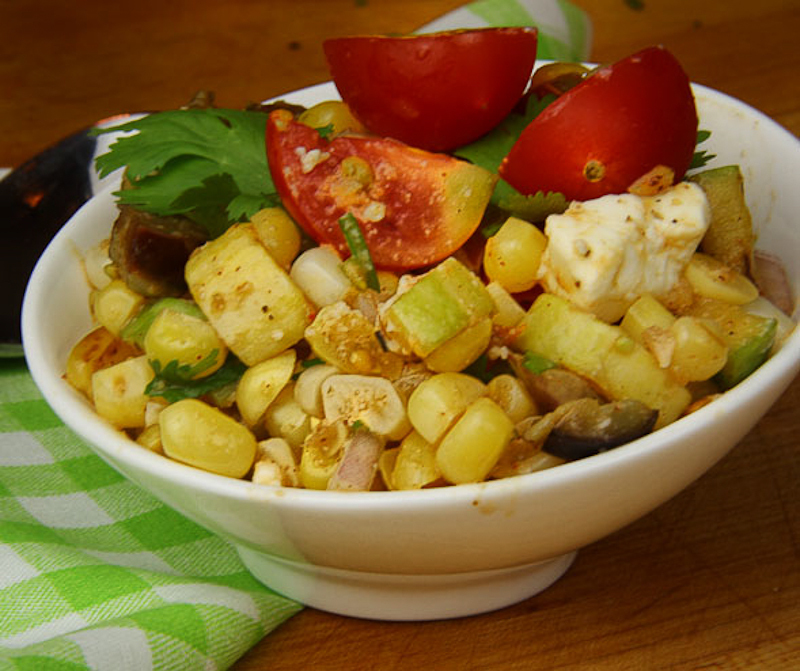 Add other chopped vegetables, feta, black bean, cilantro/parsley... anything you like. My salad included parsley, red onion, cilantro and a small piece of feta I had left over from another meal. To finish the salad, mix in 1 T lime juice or vinegar, salt, pepper, cumin and chili powder. You can eat the salad warm, or cover, chill and enjoylater. This salad is great with any grilled meat, or by itself for a light supper. Shuck corn and remove from the cob. Heat a skillet or grill pan with 1-2 tsp olive oil. Add corn in a single layer and sear until light brown marks appear on some of the kernels. Remove from pan to bowl. Add zucchin and egglant to pan and saute for 3-4 minutes. 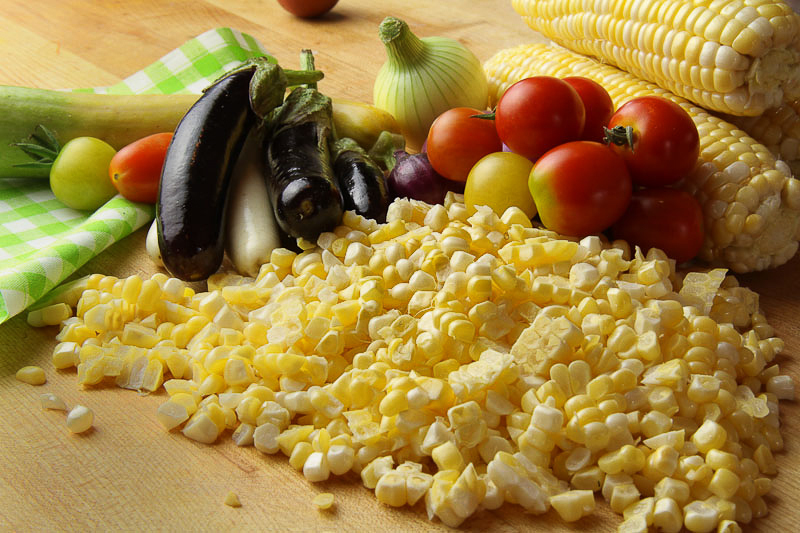 Transfer vegetables to the bowl with the corn. Add the chopped onion, and black beans. Add remaining olive oi, vinegar and spices. Toss in tomato, feta and mix gently. Remember, you can add any other vegetables or spices to make it your own!